Mechs that summon mechs? What's next? Donuts that summon donuts? Mmmmm. I hope some Redditor doesn't buy adspace to get this guy nerfed because of Glinda Crowskin and Skaterbot in Wild. This + Glinda Crowskin = Mechlock? Calling it now, balancing around this card will be the reason Boomsday crashes and burns. I am quite missing the mech decks from GVG.. seems like it's the end for such decks the theme was quite interesting.. I hated the guts out of mech mage back in the day... but it's actually quite an interesting deck in the end.. oh well.. Remember when everyone was asking to nerf this? And then Patron rised! Sick combo: Mechwarper plus anything. Sicker combo: Mechwarper plus mechwarper plus anything. Zoo is not a term that means warlock. Zoo refers to a deck built out of strong-ish low cost minions that synergize and overwhelm your opponent with board control. GVG will in my opinion make this playstyle viable for several classes (with cards like Jeeves & Mechwarper) ultimately breaking the Zoolock stereotype from hearthstone. The Zoolock stereotype will always be the case because of their ridiculous draw engine. Mechwarper? I think they meant XT-002 with his chest open to expose his heart... Blizzard's rampant WoW TCG card art re-purposing is getting to be weird/dumb... I wish they would use the original art for what it was intended for, for once. "I THINK I BROKE IT!!" it says 1 less but i didnt see a (but not less than 1) so does that mean u can flood the board full of 1/2 drop mechs right after wards? I love tribal, Lorwyn was so much fun. 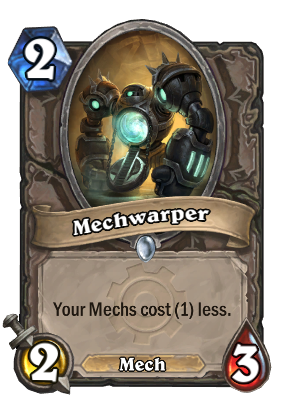 Most excited about this card with all the mech support.